We offer dinosaur bone pendants in a variety of styles and sizes from smaller daily wear pieces to large statement pendants for a night out. 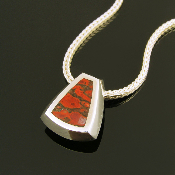 The dinosaur bone we use in our pendant designs is available in many patterns and colors with red being our most popular choice. Special orders are also welcome if you would like us to substitute or rearrange the inlay stones. Some of the dinosaur bone pendants shown may have already sold. If so, we can make a matching pendant for you in 3 to 6 weeks. Silver pendant inlaid with coral, sugilite and dinosaur bone Sterling silver pendant inlaid with gem dinosaur bone Silver pendant inlaid with dinosaur bone, opal and coral. 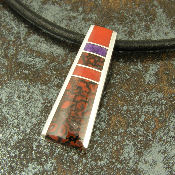 Eye catching sterling silver pendant inlaid with red coral, sugilite and red dinosaur bone by Mark Hileman. The dinosaur gem bone came from the Colorado Plateau and was a living animal during the Jurassic Period. Unique inlaid dinosaur bone sterling silver pendant. 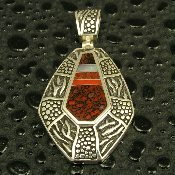 The handmade silver pendant is inlaid with one piece of gem dinosaur bone with red-orange cells surrounded by black matrix. Sterling silver pendant inlaid with two types of dinosaur bone, red Australian opal and red coral. Dinosaur bone is red celled with black matrix and red-brown with a gray matrix. The dinosaur bone we use in our pendants and other jewelry is usually referred to as “gem bone”. It is actually not bone but is a combination of minerals that have replaced the bone over time. Dinosaur bone is found in a rainbow of colors with the webbing color and cell size varying greatly from piece to piece. The varying cell size and colors create some truly unique patterns and virtually one of a kind dinosaur bone pendants, rings, earrings and bracelets. The fossilized dinosaur bones can be composed of many different minerals including agate, jasper and calcite. The dinosaur bone color is determined by the combination of minerals present when the fossilized bone was formed. Some colors are more rare than others, with multicolor cells in a nice pattern being the most sought after. High quality dinosaur bone has a hardness of 6-7 on the Moh’s scale making it suitable for jewelry use. Most of the agatized dinosaur bone used in our jewelry comes from the Colorado Plateau in Utah and was a living animal during the Jurassic Period, around 144 to 208 million years ago. Copyright © 2009-2019 Hileman Silver Jewelry. All rights reserved.